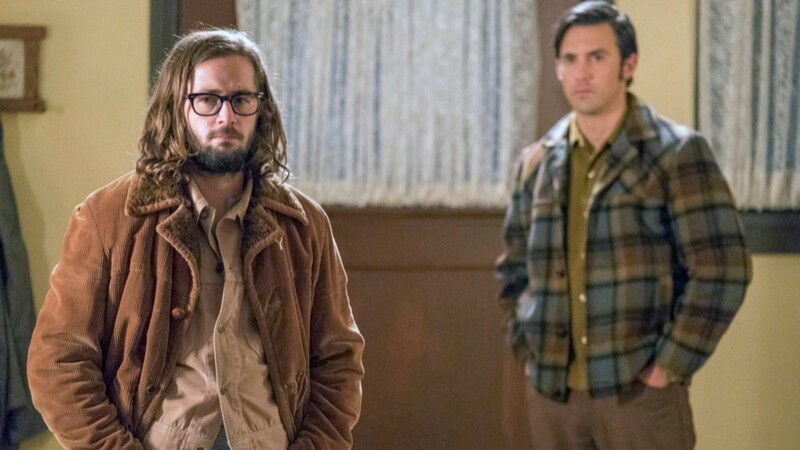 We hope you're prepared for more incoming tragedy on This Is Us, because if you thought the death of Jack (Milo Ventimiglia) was heartbreaking, you haven't seen anything yet. At least that's what newcomer Michael Angarano says about his character's death and the lead-up to it, all of which apparently has a huge impact on how Jack acts as a parent toward the Big Three. "You'll definitely understand why Jack is the way he is and the way especially that he speaks about his brother, Nicky," Angarano told Entertainment Tonight on Tuesday. "Everything will become really clear really soon." In the currently-airing season three, we're getting insight into Jack's time in Vietnam with his little brother, Nicky, who is Angarano's character. He hinted to ET that while Jack's death — an unexpected heart attack resulting from complications suffered during a house fire — was sad, the circumstances behind Nicky's death during the Vietnam war were even direr. "It's pretty tragic," Angarano said. He added, "All of it is pretty sad." Audiences first met Nicky during the Oct. 16 "Vietnam" episode of This Is Us. After it aired, Angarano told ET, “There’s one thing that you can really see in this episode that really weighs on Nicky: that he is Jack’s brother. He feels the weight of being the younger brother, always being protected, always being looked out for. It’s Jack’s plan. There’s that classic sibling dynamic in which the younger brother’s like, 'Let me go. I can do this. I can be my own person.'" However, he added, "It’s also that co-dependent relationship that he has because he needs it. There’s a part of him that doesn’t know if he can stand on his own without his brother’s help." If This Is Us is good at anything, it's tugging at fans' heartstrings — so whatever happened to Nicky, and however Jack was involved, we're sure it's going to be utterly devastating.